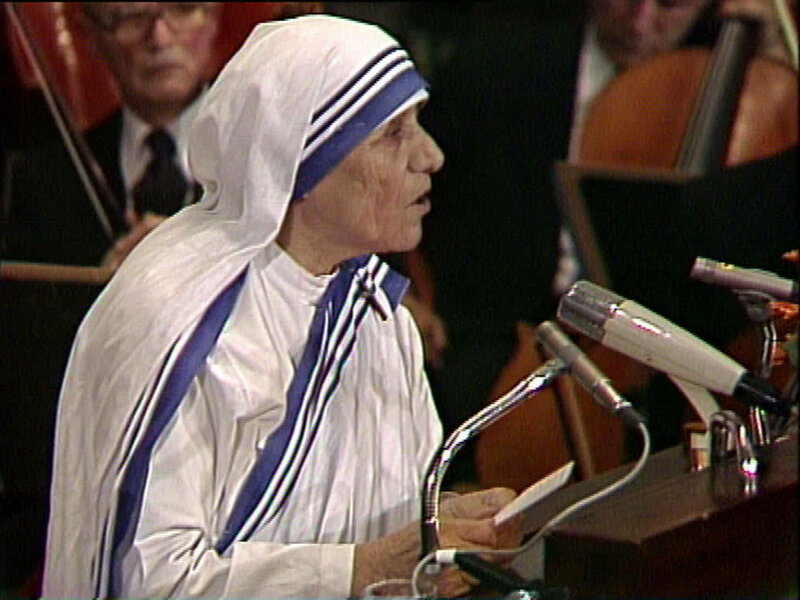 Transcript of Mother Teresa’s Acceptance Speech, held on 10 December 1979 in the Aula of the University of Oslo, Norway. As we have gathered here to thank God for this gift of peace, I have given you all the prayer for peace that St Francis of Assisi prayed many years ago, and I wonder he must have felt the need what we feel today to pray for. I think you have all got that paper? We’ll say it together. It was not enough for him to die for us, he wanted that we loved one another, that we see him in each other, that’s why he said: Blessed are the clean of heart, for they shall see God. In their name I accept the award. And I am sure this award is going to bring an understanding love between the rich and the poor. And this is what Jesus has insisted so much, that is why Jesus came to earth, to proclaim the good news to the poor. And through this award and through all of us gathered here together, we are wanting to proclaim the good news to the poor that God loves them, that we love them, that they are somebody to us, that they too have been created by the same loving hand of God, to love and to be loved. Our poor people are great people, are very lovable people, they don’t need our pity and sympathy, they need our understanding love. They need our respect; they need that we treat them with dignity. 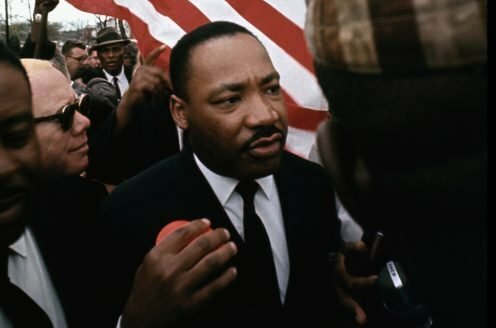 And I think this is the greatest poverty that we experience, that we have in front of them who may be dying for a piece of bread, but they die to such dignity. I never forget when I brought a man from the street. He was covered with maggots; his face was the only place that was clean. And yet that man, when we brought him to our home for the dying, he said just one sentence: I have lived like an animal in the street, but I am going to die like an angel, love and care, and he died beautifully. He went home to God, for dead is nothing but going home to God. And he having enjoyed that love, that being wanted, that being loved, that being somebody to somebody at the last moment, brought that joy in his life. And I feel one thing I want to share with you all, the greatest destroyer of peace today is the cry of the innocent unborn child. For if a mother can murder her own child in her womb, what is left for you and for me to kill each other? Even in the scripture it is written: Even if mother could forget her child – I will not forget you – I have carved you in the palm of my hand. Even if mother could forget, but today millions of unborn children are being killed. And we say nothing. In the newspapers you read numbers of this one and that one being killed, this being destroyed, but nobody speaks of the millions of little ones who have been conceived to the same life as you and I, to the life of God, and we say nothing, we allow it. To me the nations who have legalized abortion, they are the poorest nations. They are afraid of the little one, they are afraid of the unborn child, and the child must die because they don’t want to feed one more child, to educate one more child, the child must die. And here I ask you, in the name of these little ones, for it was that unborn child that recognized the presence of Jesus when Mary came to visit Elizabeth, her cousin. As we read in the gospel, the moment Mary came into the house, the little one in the womb of his mother, lift with joy, recognized the Prince of Peace. And so today, let us here make a strong resolution, we are going to save every little child, every unborn child, give them a chance to be born. And what we are doing, we are fighting abortion by adoption, and the good God has blessed the work so beautifully that we have saved thousands of children, and thousands of children have found a home where they are loved, they are wanted, they are cared. We have brought so much joy in the homes that there was not a child, and so today, I ask His Majesties here before you all who come from different countries, let us all pray that we have the courage to stand by the unborn child, and give the child an opportunity to love and to be loved, and I think with God’s grace we will be able to bring peace in the world. We have an opportunity here in Norway, you are with God’s blessing, you are well to do. But I am sure in the families and many of our homes, maybe we are not hungry for a piece of bread, but maybe there is somebody there in the family who is unwanted, unloved, uncared, forgotten, there isn’t love. Love begins at home. And love to be true has to hurt. I never forget a little child who taught me a very beautiful lesson. They heard in Calcutta, the children, that Mother Teresa had no sugar for her children, and this little one, Hindu boy four years old, he went home and he told his parents: I will not eat sugar for three days, I will give my sugar to Mother Teresa. How much a little child can give. After three days they brought into our house, and there was this little one who could scarcely pronounce my name, he loved with great love, he loved until it hurt. And this is what I bring before you, to love one another until it hurts, but don’t forget that there are many children, many children, many men and women who haven’t got what you have. And remember to love them until it hurts. Sometime ago, this to you will sound very strange, but I brought a God child from the street, and I could see in the face of the child that the child was hungry. God knows how many days that not eaten. So I give her a piece of bread. And then the little one started eating the bread crumb by crumb. And I said to the child, eat the bread, eat the bread. And she looked at me and said: I am afraid to eat the bread because I’m afraid when it is finished I will be hungry again. This is a reality, and yet there is a greatness of the poor. One evening a gentleman came to our house and said, there is a Hindu family and the eight children have not eaten for a long time. Do something for them. And I took rice and I went immediately, and there was this mother, those little one’s faces, shining eyes from sheer hunger. She took the rice from my hand, she divided into two and she went out. When she came back, I asked her, where did you go? What did you do? And one answer she gave me: They are hungry also. She knew that the next door neighbor, a Muslim family, was hungry. 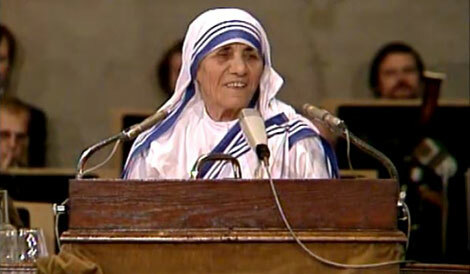 Mother Teresa held her Acceptance Speech on 10 December 1979, in the Aula of the University of Oslo, Norway.